I knew that Rian Johnson was fond of putting references to esoteric ‘80s computer and video game trivia in his movies — one of the tokens on the ship DJ and BB-8 steal from Canto Bight is a Zorkmid — but it looks like the entire opening sequence in The Last Jedi is a tribute to an obscure Activision game called The Dreadnaught Factor. 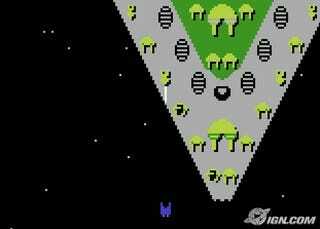 Designed by Tom Loughry, it was released for the Intellivision in 1983 and the Atari 2600 and 5200 in 1984. When I saw the movie back in December, the scene in which Poe Dameron singlehandedly disarms the First Order dreadnaught reminded me of something, but I couldn’t quite put my finger on it. It took a second viewing of the movie, plus stumbling across an extended review of the cartridge on Classic Game Room the other day to jog my memory. In both The Dreadnaught Factor and The Last Jedi, the good guys’ home base is threated from orbit by a giant wedge-shaped space cruiser capable of laying waste to a planet’s entire surface. In addition to this armament, the ship’s superstructure is bristling with defense cannons and missile launchers capable of repulsing attackers. As in Jedi, the only way to destroy the dreadnaught is by skimming over its surface in a small, highly manueverable fighter, taking out each cannon one at a time while dodging incoming fire and enemy spacecraft. It’s not quite the same as the Last Jedi battle, relying entirely on in crude 2-D graphics and featuring no catty “Yo mama” jokes at the villains’ expense (although, of course, the players can always provide their own). Also, your fighter can deliver the death blow without the help of weirdly anarchronistic bomber fleets. But the overall resemblance is pretty remarkable. So remarkable, I had to tweet Johnson himself to confirm it. I’m almost 100% positive he’ll get back to me as soon as his busy schedule allows.